We can no longer ignore the amount of waste that we create on a daily basis. Of course the invention of plastic has been a major change in the way we function and our expectations from a convenience point of view. 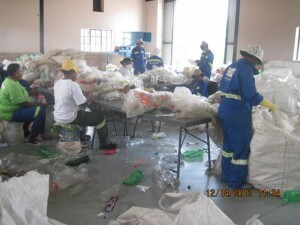 Managing plastic waste has one of the biggest impacts on waste management. It’s interesting that in most indigenous cultures there is no word for waste. Here in South Africa, we have adapted the word “Checkers” to describe a plastic bag which is known as our “new national emblem”. Ignorance is no longer an excuse for contributing recyclable waste into traditional landfill sites. Please be aware of your waste and recycle! 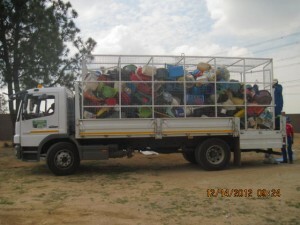 The Greater Kyalami Conservancy (GEKCO) and Residents’ Associations are partnering with BONTLE KE TLHAGO, a cooperative of Diepsloot residents to offer kerbside recycling as a GREEN NEIGHBOURHOOD PROJECT initiative. In discussions with Pikitup it was agreed to choose a pilot area, Glenferness andKyalami Ridge, to test logistics and buy-in from the residents. If the pilot is successful, the initiative will be expanded to include surrounding suburbs. In the first month the volumes collected have tripled and we hope to expand to Kyalami Ext 1 and Saddlebrook by the beginning of August 2014. This is part of the City of Jo’burg’s SEPARATION@SOURCE which Pikitup plans to roll out to all areas of the city. The lack of available space for landfills is a serious problem and Pikitup is looking to address this while assisting cooperatives to develop viable, profitable businesses. This is an exciting opportunity for each of us to play a part in protecting the environment while supporting our neighbours in Diepsloot. Recycling collection is on the same day as normal Pikitup collection. Pikitup has dropped off pamphlets and bags to each of the houses in the pilot area. Please place the recyclables out next to your black bins in the method described below. Paper products – Please place in the white bag, this is to ensure that the paper remains dry.